I’m constantly looking for little wins in my day-to-day nutrition plan. What caught my eye was the fact that an average portion of 4/5 of these little bad boys is only 100kcals. Not that I’m too bothered by calorie counting, as you guys know, but worth keeping in mind! So rather than nibble on (let’s be honest) boring rice cakes, I’ve started nibbling on some prunes dipped in crunchy nut butter- in a word…DIVINE!!! They have even become my go-to cinema snack! They can improve bone health- rich in calcium and vitamin D.
They are also rich in magnesium (which held us sleep and relaxes our muscles), boron, copper, vitamin K (blood clotting!) and potassium (nervous system and blood pressure regulation). 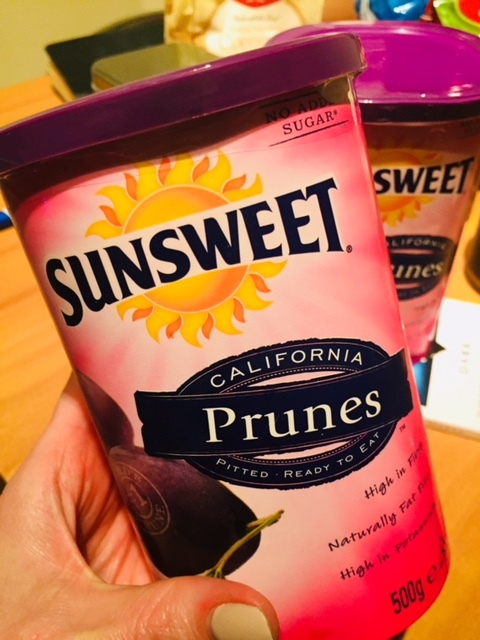 Despite their sweet taste, they are actually low in terms of their glycemic index and load meaning your body doesn’t go crazy with elevated blood sugar levels (and they are absorbed slowly by the body too!) when you eat them. I always tell my readers and followers to try and incorporate a healthy fat or protein when eating any sweet foods, but you don’t need to be worried when it comes to eating prunes in terms of your blood sugar response, if eaten in moderation. 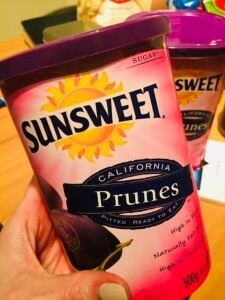 In general, they are super easy to cook or prep with- and are in essence an alternative to fat/sugar in your recipes. 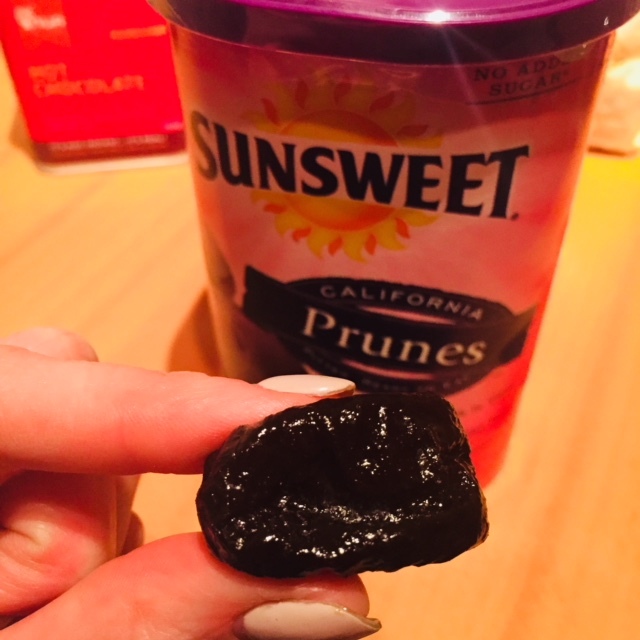 I’ve swapped out my dates for any of my sweeter recipes now as believe it or not dates have a much higher sugar content than prunes! 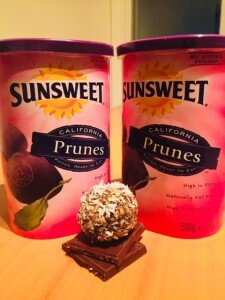 Here’s one of my favourite little prune recipes for you to try- ideal for lunch boxes, office tea breaks and on-the-go! You can also find loads of other tasty ways to incorporate these sweet little jewels into your diet here. 1. Blitz almonds in a food processor until mixed well but not fully ground. 2. Add the chopped prunes, protein powder, chia seeds, cocoa powder and almond butter and pulse until well mixed together. 3. Add in your melted coconut oil and pulse until your mix holds well together as you will be forming it into little balls. 4. Roll into little balls- I recommend about a spoonful for one ball. 5. Roll the little balls in your coconut or in some melted chocolate. NOTE: Refrigerate for 30 to 45 minutes to set. Store in airtight container in refrigerator for up to 1 week. Approx 100 kcals per ball! If you’re anything like me, take it that you will eat at least 4 or 5 though oops!